The city of La Salle is located in La Salle County, Illinois, at the intersection of Interstate 80 and Interstate 39. It is part of the Ottawa–Streator Micropolitan Statistical Area. Originally platted in 1837 over one square mile, the city has grown to 12 square miles (31 km2). After Illinois had declared statehood on December 3, 1818, it was only a matter of time before settlers began moving into the Illinois Valley. 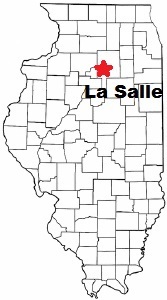 LaSalle County was established on January 15, 1831. One of the original, more well-known settlers of the area was Aaron Gunn. He eventually purchased the tract of land that is now located just north of Eleventh Street, between Chartres and Bucklin Streets. Other settlers included Samuel Lapsley and Burton Ayers. Lapsley built a log cabin between Fourth and Fifth Streets, south of the present location of LaSalle-Peru Township High School in 1830. Additionally, he constructed a saw mill that was located in the Little Vermillion, just below the Matthiessen and Hegeler Zinc Company, or the M&H property. Ayers owned a log cabin and shop where he made plows on the corner of Sixth and Union Streets. As the dream of constructing a canal from this area up to Chicago became a reality, the need to create towns along its banks grew. Consequently, the city of LaSalle was platted in 1838. At this time, many purchasers of the lots were canal workers or shopkeepers hoping to sell supplies to the workers. The canal was officially opened on April 16, 1848. Four days later, the “General Thornton” became the first boat to travel the canal.